Early in the summer of 2015 I had made a commitment to myself to finish some of the books I started reading, but for one reason or another, hadn’t finished. Perfectly Unique by Annie Downs is one of those books. As I read the book, I was looking for quotes and ideas to infuse into my conversations with my daughters. And I was also inspired to write a series of three letters to our sponsored children. These letters are quite simple, but I hope the message is clear. Every child is planned for, loved, and has purpose. That is what I want each of my own children to know and believe, and each of our sponsored children well. Feel free to use these letters, but please do not post them anywhere else. Instead, if you want to share these letters, please link directly these posts. Greetings in the name of Jesus our Lord, Who created us, loves us and redeems us. This is a wonderful thing to think about. We are created, loved and redeemed from the sinful hearts inside us! Neema, you were created, you are loved and you have been offered forgiveness and wholeness by your Creator! God knows you Neema, and in the days He has planned for you, He has good plans. I pray that today you will find joy and peace in knowing that the One Who created you, sees you, loves you and has wonderful plans for you. The Bible says that you are made in His image. That means you are amazing and wonderful! What do you think are your best qualities? What do you like about yourself? What are you good at? I hope you reply to this letter soon. You and your family are in my prayers, that you will know the height, the depth, the length and the width of God’s great love for you. Included with these letters I have attached photos of beauty in nature. 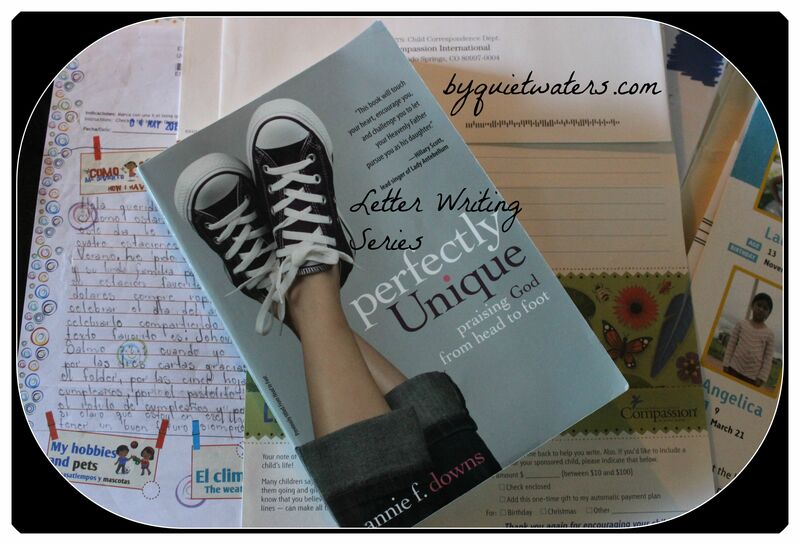 What have you been writing to your sponsored children about? What a beautiful letter. I think it’ll really encourage your kids. What a great idea.